After a successful Internet broadcast of last weekend's Winter Guard International (WGI) Color Guard World Championships, Drum Corps International is back in Dayton, Ohio this weekend to assist in providing a live Webcast of performances at the WGI Percussion Championships. "We have received rave reviews from fans who enjoyed the Webcast from the Color Guard Championships last weekend," said WGI Marketing Manager Bart Woodley. "We broadcast 26 hours of live performances over two days, and we're excited to be able to do the same this weekend for our percussion fans." 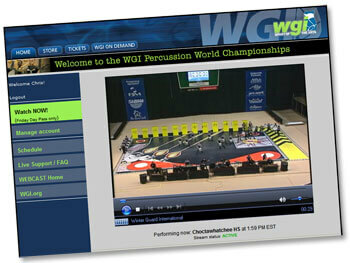 Fans can follow along online this Friday and Saturday at the WGI Percussion World Championships. A one day pay-per-view pass of the Friday prelims and finals performances costs only $9.95, and a one-day pass to watch Saturday's finals competitions costs only $14.95. If you can't make it to Dayton to watch from the stands, don't miss out on this chance to see some of the world's best percussion ensemble performances from the comfort of home. Sign up and start watching today at WGI.org.